THE KING OF THE NAKED SUPER SPORTS IS LEFTOVER AND ON SALE BIG TIME!! RIGHT NOW SAVE $2,800 AND TAKE ADVANTAGE OF FINANCING AS LOW AS 5.99% DURING TRIUMPH’S SPRING UNCHAINED SALES PROMOTION! Ever wonder why Triumph wins so many awards and trophies, that’s because the entire company is built on a racing heritage that rivals few other names in the business. So when they set out to create a Roadster that would be unrivaled on the street they pulled out all the stops. Faster, more torque, lower center of gravity, and then added some of the most race-ready components ever put on a stock production bike. 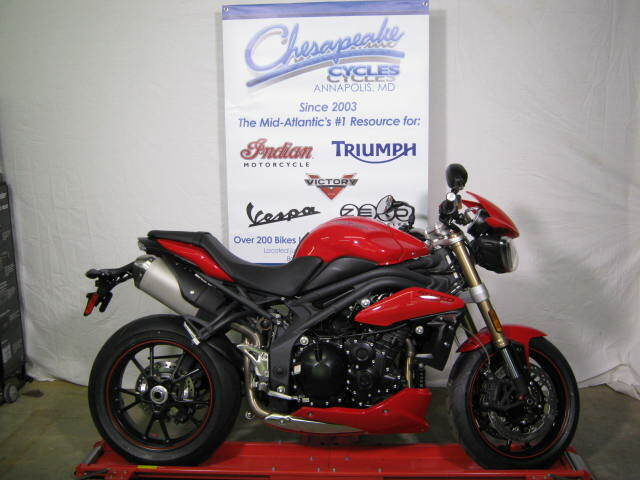 Want to see what the view from out front looks like, grab a Speed Triple and never look back!